His disappointment of only getting one game at Euro 2016 has not spoiled Fleetwood full-back Conor McLaughlin’s year. In fact it inspired him to knuckle down and he now heads into 2017 having forced his way back into the Northern Ireland starting line-up – and helping Town battle it out at the right end of the table. McLaughlin (pictured) started Northern Ireland’s opening game defeat to Poland during the summer but did not feature as Michael O’Neill’s men went on to reach the competition’s knockout stages. Since then the right-back has battled his way back into the starting XI and scored his first ever international goal in their 4-0 2018 World Cup qualifying win over Azerbaijan. He has also been a key figure in Town’s turnaround from relegation candidates to play-off contenders. 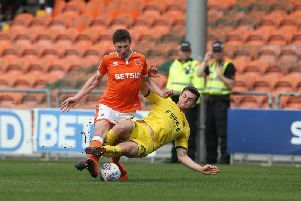 McLaughlin, who has been offered a new deal and attracted attention from Championship clubs like Leeds United and Reading in the summer, is aiming to finish the year on a high with victory over Oldham Athletic. He said: “It was a bit mixed. I was buzzing with all of the build-up to the Euros, disappointed I didn’t play more but I will look back on that and think the experience of it and just being there was unbelievable.